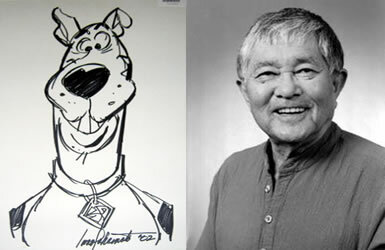 Cuando hace tan solo 3 semanas había muerto Joseph Barbera, ahora nos llega la noticia del fallecimiento de Iwao Takamoto, dibujante que creó al perro de dibujos animados Scooby-Doo, así como personajes de “Los Picapiedra” y “Los Supersónicos”. Takamoto murió en el Hospital Cedars-Sinai de Los Ángeles el lunes 08 de enero a los 81 años, después de sufrir un infarto. Takamoto diseñó a Scooby-Doo, su famélico y cobarde dueño Shaggy, y a sus amigos Velma, Daphne y Fred a finales de la década de 1960 cuando trabajaba en el estudio de animación Hanna-Barbera. El nombre del gran danés estaba inspirado en una frase improvisada al final de la canción “Strangers in the Night”, de Frank Sinatra. También diseñó a Astro, el perro de la familia de “Los Supersónicos”. Para “Los Picapiedra” creó al Gran Gazoo, el famoso extraterrestre verde. Takamoto también trabajó en clásicos de Disney como «La Cenicienta» y «La bella durmiente» o en filmes más llenos de perros como «Ciento un dálmatas» o «La dama y el vagabundo». Viendo el curriculum de Takamoto es interminable listar todas las series animadas donde participo como dibujante o como parte del equipo productor. Entre las series animadas tenemos a The Kwicky Koala Show, Scooby Doo donde estas, los super amigos, Los Picapiedras, Hong Kong Phooey, los Supersónicos, los Gobots, Jhonny Quest, los Harlem Globe Trotters, Penélope Glamour, Josie y los Pussycats, las aventuras de Gulliver, la carrera de los autos locos, entre otras. Por último quiero agradecer a Lisardo Rico quien nos mandó la noticia al portal. Lisardo, tengo 31 años. Gracias por tus palabras. :mrgreen: Trataremos de seguir pa lante con este proyecto. Scooby Doo no era boxer sino un Gran Danés. De dibujante a Vicepresidente de la misma compañia en verdad que es un ejemplo de meritocracia la de este Señor Takamoto. I’d come to comply with you one this subject. Which is not something I usually do! I love reading a post that will make people think. Also, thanks for allowing me to speak my mind! Hey – nice blog, just looking around some blogs, appears a pretty good platform you are utilizing. I’m currently utilizing WordPress for a couple of of my sites but looking to change one of them about to a platform comparable to yours as a trial run. Anything in specific you’d suggest about it? An awesome article, I just passed this onto a student who was doing a little analysis on this. And he in fact purchased me breakfast because I discovered it for him…. :).. So let me reword that: Thnkx for the treat! But yeah Thnx for taking the time to discuss this, I feel strongly about it and enjoy learning more on this topic. If possible, as you become expertise, would you mind updating your blog with more information? It is highly helpful for me. Big thumb up for this blog post! I dig computer games. Facebook games are entertaining a lot of the time. Sometimes they’re very lame. Thanks so much for this! I haven’t been this thrilled by a blog for a long period of time! You have got it, whatever that means in blogging. Well, You are certainly somebody that has something to say that people need to hear. Keep up the outstanding work. Keep on inspiring the people! shows view of the situation. information, i really like finding thoughts that make sense and are worthwhile anyway. Useful post, this is. It is actually wonderful to find a post that is valuable. Yet again you come out with content. often that you find that kind of information with such detail. I was doing, and I am on the look out for. Damn, nice site. I came across this on Yahoo, and I am extremely happy that I did. I will definately be coming back here more often. Wish I could add to the info and bring a bit more to the table, but am just taking in as much info as I can at the moment. am very pleased to locate this web site.I wanted to say many thanks to you with regard to this wonderful learn!! I definitely enjoyed every little bit of it and I’ve you bookmarked to test out new things you publish. That was a fun viewpoint. I’ll come back and see what else you are up to. Don’t forget this is the season to take care of family and friends. Peace! Bonjour. Je travaillerai en Suisse. J’y tiens. Conseils très utiles.